Mary Moore mentioned at the same meeting that her husband makes liquid fertiliser from bags of sheep manure and used washing machine water (grey water). He mentioned that there is nothing scientific about the quantities. When the water in the black storage bins starts to look clear, he dumps another litre of so of the fumier into it. That is usually good for four or five washes or so - about 250 litres. It is only used for plants in the ground and mainly for hedges in places where he wants to encourage growth. It is not suitable for plant pots, mainly because of a build up of the soap ingredients which are present in the grey water. 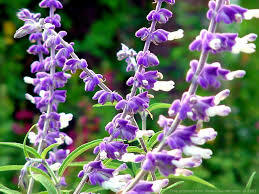 There are about 900 species of Salvia. They are divided into two parts of the world - the Old World - Salvias from Europe, Asia and Africa and - the New World - Salvias from the Americas. The colours are more subdued, of pink, blue and purple. They are sub-divided into 3 Groups. 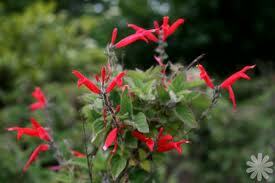 Group 1: Salvias with foliage that form a basal rosette or clump, from which the flowering stem arise. They flower in early summer with repeat flowering if pruned. Salvia’s belonging to this group are Salvia pratensis (Meadow Clary). 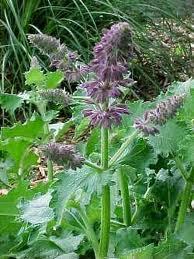 When you visit the Vaucluse in July you see field after field of Salvia sclarea (Clary Sage) grown for the parfume industry. 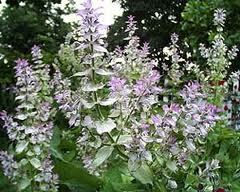 Salvia officinalis (Common Sage) with its cultivars belong to this group. Salvia verticillata, a very common Salvia in our area, growing on the side of the road. 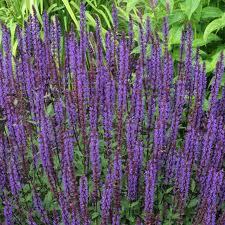 Apart from the Common Sage, that is used in cookery and medicinally, the Salvia’s we notice most of all are the ones from the New World. The colours are so bright, flamboyant, Mexico alone has 312 species. They again are sub-divided into 3 Groups. Group 1: Salvias from the USA. Many of them from the arid regions of California. In their native area they flower after the winter rain and are dormant in the summer. 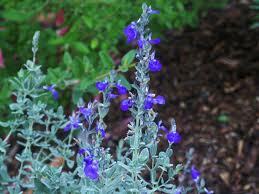 Salvia greggii and Salvia microphylla are closely related and it is quite difficult to differentiate between the two species. 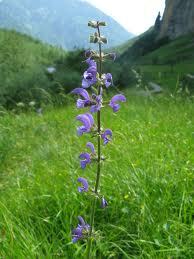 Salvia greggii has small, elliptic, glabrous, leathery leaves with entire margins. The flower colour ranges from white, light yellow to deep orange, purplish red and reddish pink. Salvia microphylla leaves are pale green, ovate to elliptic, larger than the leaves of Salvia greggii, slightly hairy with serrated margins. When crushed the leaves smell of blackcurrant. Colours range from pink to deep red. 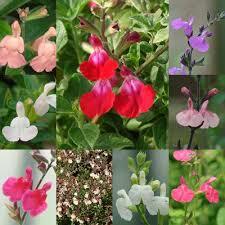 Salvia greggii, Salvia microphylla and Salvia chamaedryoides are easy to buy. 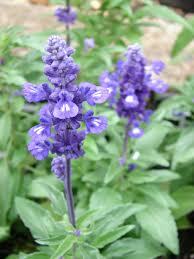 Pepiniere ‘Armalette’ in Sillans la Cascade has a large selection of Salvias. They can get very straggly at the end of the season. 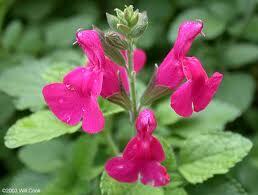 Isabelle, one of our club members, is very successful with her Salvias. Her advice is to prune them in early spring to a couple of inches above the crown, after their first flush of flowers prune them again but not so low as in early spring, but down to about 25 cm, they will get another flush of flowers in autumn, then leave them un-pruned till late winter. Feed with general purpose fertilizer before new growth begins. Best time to plant is in spring. Group 3: The Salvias in this group are the most striking of all. Unfortunately many of them are quite tender and unless taking into a greenhouse will not survive the winter or die down during the winter and come up again in spring. They are native to the more tropical areas of Mexico, Central and South America. Most of them are large, bushy perennials and although they are perennials, quite a few of them are grown as annuals in northern Europe. In their native habitat they grow in forests or in shady conditions, because of this they need humus added to their soil when planting and require watering in very hot or dry periods. We have seen several of them whilst visiting gardens on the coast. 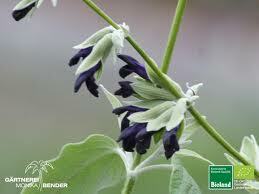 In William Waterfield’s garden, right in front of the house was growing the blue-black flowering, Salvia discolor. in spring it should be cut down to just above ground level. On a garden visit to Mr Cuche’s garden in Claviers we saw Salvia leucantha. One of us bought the plant and this year I was given a rooted cutting. I’ve planted it in the garden, it has become quite big, but no flowers yet. During the winter I’m going to cover it with leaves and then cover the leaves with chicken wire to keep the leaves in place. 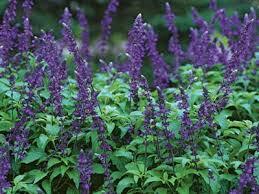 As with most Salvias this plant can get a bit messy. As it is principally an autumn flowering plant, the spent flower heads can be pruned back, but the actual pruning should not be done till spring. Prune back to the new growth. 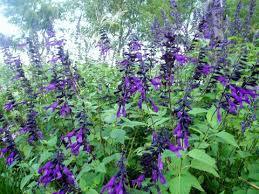 An other well-known one is Salvia farinacea, it dies down every winter, but comes back again in the spring. Salvia ‘Indigo Spires’, very popular cultivar at the moment flowers all summer, again this one dies down in winter but comes up in spring. 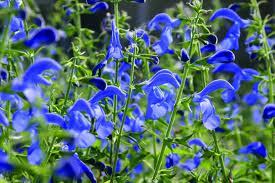 Salvia patens with its beautiful blue flowers can be treated like Dahlia tubers. The tubers are lifted and stored in a dry place to be planted out in spring. Salvia elegans (Pineapple Sage), an autumn flowering Salvia, with scented leaves and bright red flowers is best stored in a frost free place during winter and pruned to just above soil in spring. If left in the soil here in a protected place it will die down and come up again in spring.